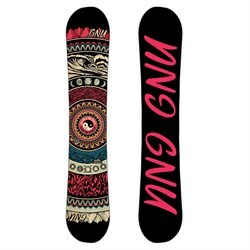 The GNU Ladies Choice Asym C2 Snowboard is the brainchild of creative mountain mind, Jamie Anderson. Combining several seasons of refined design, a premium eco-friendly construction, and fresh artwork done up by Sarah King, this board is a foolproof choice for riders that want an aggressive all-mountain freestyle weapon that thrives both in and out of the park. Designed with an asymmetrical shape and core profile, the GNU Ladies Choice Asym C2 Snowboard loves to rail heelside turns and ignite the chairlift with saucy methods down the pro-line. C2  Rocker between your feet combined with radial cambers out to the contact. Freestyle freedom and carving of rocker between the feet for a more aggressive ride. Level 2 Asym Scale | Sidecut, Core & Contacts  Asymmetric wood core allows for softer flexing on the heelside. There is also a deeper sidecut on the heelside and asymmetric contact angles and length. Shorter heelside contact. Asymmetry  The human body is asymmetric. Turn mechanics on a toe and heel side turn are completely different. 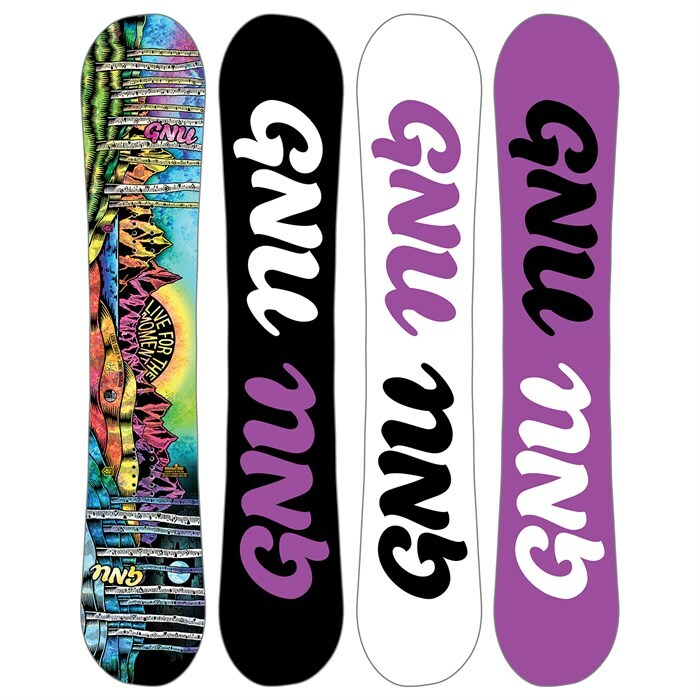 GNU builds in asymmetric balancing concepts to each side of your snowboard harmonizing with nature and creating a more efficient, less tiring, unreal ride. Aspen / Columbian Gold / Asym Paulownia Alloy  Balanced, lighter, sustainable, FSC-certified, strong and poppy. Tri-Ax / Bi-Ax  A glass and fiber reinforcement combination to give the snowboard a long life and plenty of pop. Recycled UHMW  Tough, fast, and environmentally friendly. Sintered Knife Cut  Easy, tough and holds wax. Magne-Traction®  Unreal edge hold; 7 strategically located and sized edge serrations provide unreal edge hold and control in all conditions. Eco Sublimated Bio Beans  Tough and environmentally friendly. Freestyle Freestyle or park snowboards tend to be a bit shorter in length and love terrain parks, rails, jibs, trash cans, tree trunks, riding switch (non-dominant foot forward), wall rides and more. 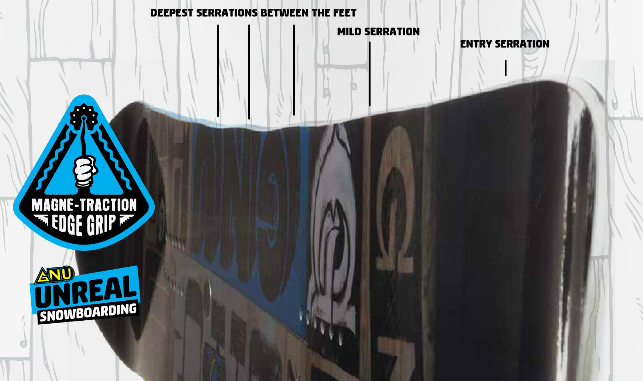 Freestyle boards often feature a true twin shape, and are typically selected by those looking to ride the terrain park. A more versatile variant of a freestyle board is the all-mountain freestyle, which combines the versatility of an all mountain snowboard with the playfulness of a freestyle snowboard. All-Mountain All-mountain snowboards are designed for exploring the whole mountain. They are your go-to for a snowboard that will do anything. They feel at home on groomers, powder, park runs and almost anything in between. The vast majority of snowboarders choose all-mountain boards for their great versatility. If you’re just getting started or unsure of exactly what you need, an all-mountain snowboard is a great choice. Advanced-Expert Whether you charge the steepest lines, hit the biggest jumps in the park or carve with race-like precision, advanced to expert level skis, snowboards, boots and bindings are for the more aggressive rider. In skis and snowboards, you'll often find layers of metal, carbon or other stringers for rigidity and power, while advanced to expert level boots and bindings are usually on the stiffer side of the spectrum for rebound and precision steering.